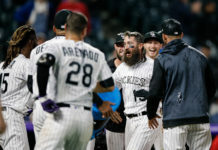 The Colorado Rockies lost more than just another contest on their 11-game losing streak on Wednesday to the Los Angeles Angels. Manager Walt Weiss, starting pitcher Jordan Lyles, and first baseman Justin Morneau’s services were all taken away from the Rockies throughout the day in Anaheim. Luckily, none of them are expected to miss extended, if any, time. Weiss underwent an emergency appendectomy after he went to the hospital with stomach pains just a couple of hours before Wednesday’s first pitch at Angels Stadium of Anaheim. Rockies bench coach Tom Runnells served as the acting manager Wednesday night and will continue to do so until Weiss is ready to return to the dugout as the Rockies start a four-game series with the NL-West leading Los Angeles Dodgers on Thursday. Things didn’t get any better for the Rockies once the game started. Lyles took an Albert Puhols comebacker off his pitching hand and was replaced by Christian Bergman after just one inning. The hand swelled up, but Lyles was surprisingly able to avoid any fractures. He appears to have dodged a bullet and a stint on the disabled list. Morneau became light-headed after a diving for a catch the eighth inning. With his long history of concussion, the Rockies elected to pull the first baseman from the game for precautionary reasons. Morneau is expected to be fine moving forward, but you can never be to sure with head injuries and dizziness.